I’m all about weird combinations when it comes to food, and I’m especially into food that mixes sweet and savory. I dig chocolate and bacon, pineapple on pizza, and I even thought olive oil on ice cream wasn’t half-bad the time I tried it. So when I heard about No. 7 Sub, a small sub shop at the Ace Hotel known for its unusual ingredients and crazy combos, I felt like it was calling my name. With pairings that included fried oysters with pickled strawberries, zucchini parmesan with BBQ potato chips (inside the sub, not with it), and brie with plantain chips, the indecisive side of me was out in full force. I went back and forth between all of them but in the end I decided I was in a pork kind of mood (really, when am I not?) 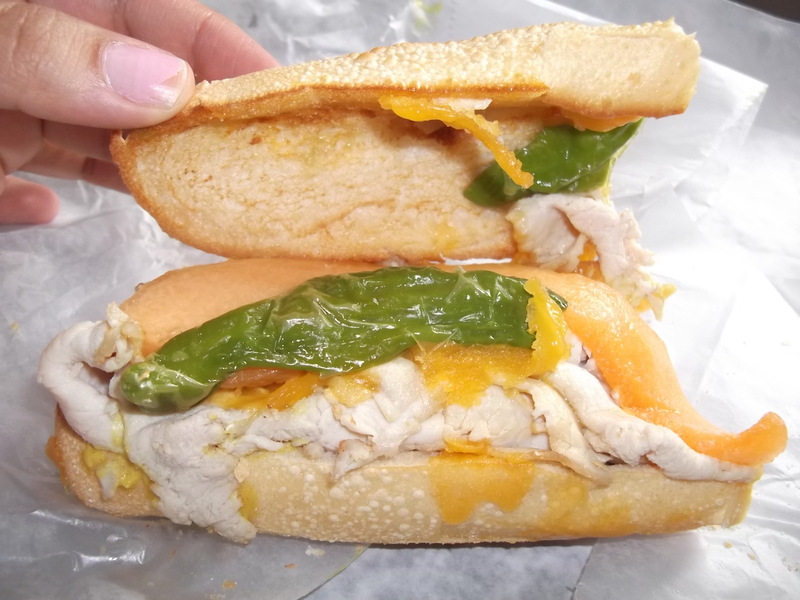 so I went with the roast pork sub, featuring cheddar cheese, melon, shishito peppers, and Chinese mustard in addition to the piggy. Subs like this really make me wonder how some people eat turkey, swiss, tomatos, lettuce and vinagrette on whole wheat day in and day out. BORING. The roast pork at No. 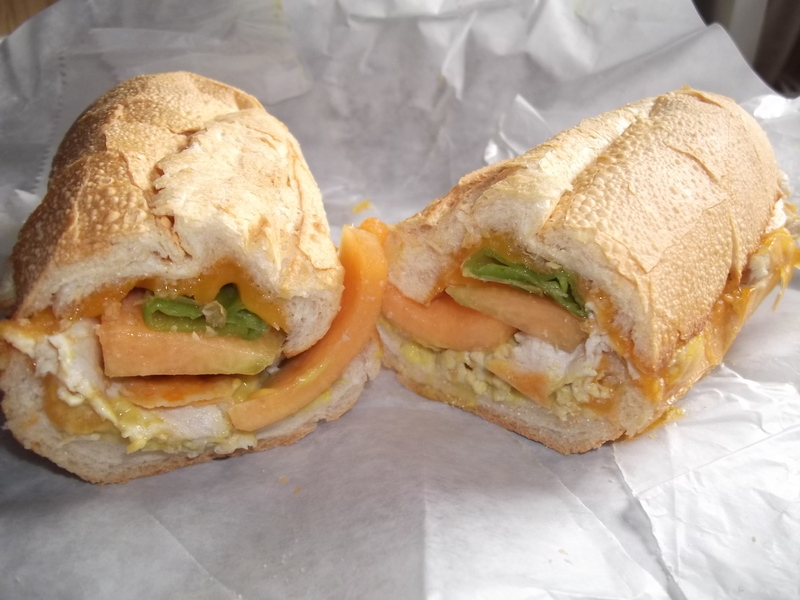 7 was everything that a regular ol’ Subway (or similar) sub is not. It was tasty and bright, interesting and unpredictable. One bite had the spicy, horseradish-like heat of the chinese mustard, while another had the refreshing sweetness of the melon (one of my favorite fruits, too) and some had that sour spiciness of the shishito peppers. The cheese gave it a sense of familiarity and the pork, which was more subtle compared to the other flavors, was a good taste to tie everything together. This sub and I hit it off right away, and with nine other subs to try on the menu, I’m looking forward to all the other strange (and probably delicious) combinations in store for me there. This entry was posted in Lunch and tagged Ace Hotel, cheddar, Chinese mustard, melon, No. 7 Sub, pork, shishito peppers. Bookmark the permalink.